What is the first thing that comes to your mind when someone says digital marketing? Facebook and other social media, of course. In the 21st century, they've done two things. They changed the way we live and the way we promote our products and services. Everyone knows it's important to expose your business on Facebook. But that same exposure is useless if you don't present it to the right people. Imagine your Facebook page as a person. That person is at a party and wants to meet someone interesting, but she/he keeps bumping into wrong people. The same thing might happen to your page without the right guidance. Let us be your digital wingman. Since tourist season in Croatia is at its highest during summer, especially throughout the Adriatic, almost every city nearby was a competition to Biograd. 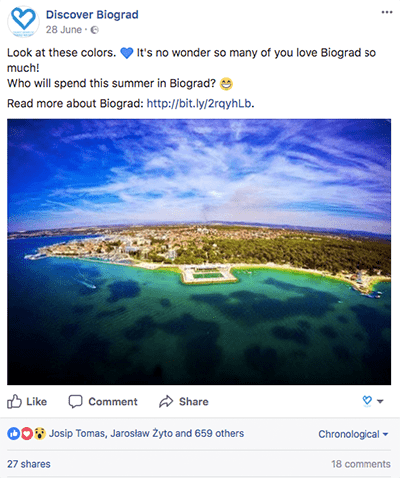 To overcome that, we had to find a way to highlight why Biograd is a far better choice and what it offers that other cities don’t. According to our client’s needs and request, we created a content plan for 7 posts a week on Facebook, 3-4 posts a week on Instagram plus occasional Insta Stories and 3-4 tweets a week on Twitter. 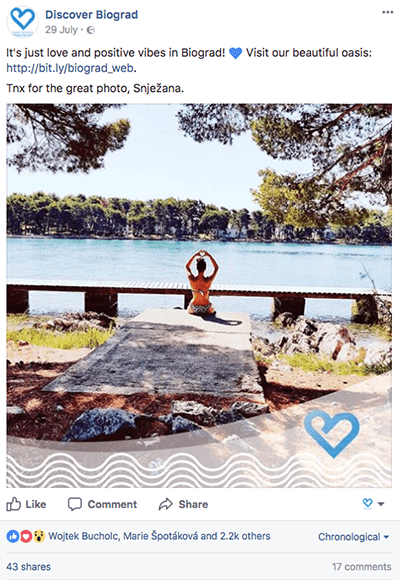 These social networks were used to promote Biograd’s tourist offer, natural beauties, sporting and recreational opportunities, wellness and spa locations, beaches and pools in the area to show people this city can satisfy anyone’s vacation needs. Each week, we made a plan for a week ahead, making sure we covered all relatable topics, but also that we announced events such as concerts or festivals that could be interesting to attend. Obviously, once these events were done, we also did a follow up by posting photos and/or videos so people could see what the atmosphere was like. 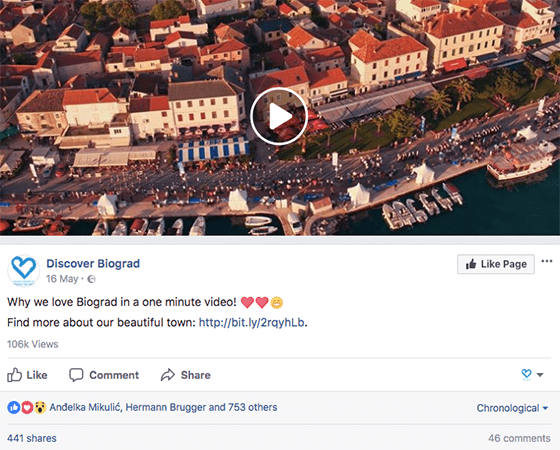 As a narrative of our posts, we focused on storytelling because the purpose was to introduce Biograd to a potential tourist and interested travelers as a destination they would like to visit, see and fully experience. 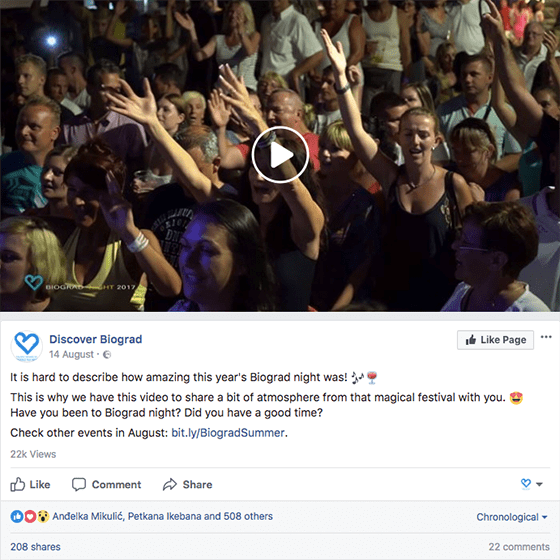 Combining that with beautiful shots of Biograd and videos from various events and ongoing manifestations, we managed to engage our target audience better than ever before. 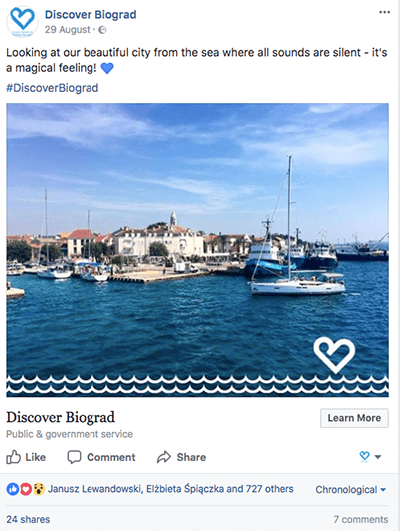 By using Facebook advertising and proper targeting, we reached people from five different European countries allowing us to show them beauties of Biograd and possibly inspire them to visit this coastal town. 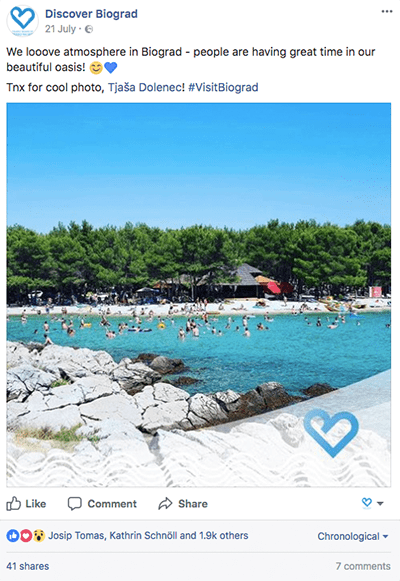 We also combined that with advertising our content to everyone in Biograd region so tourists who were currently there on their vacation would get full experience online and offline. It also served as a reminder to them of an event in the area and cultural and historical sights worth visiting. Such efforts proved to be the right approach since, within just a couple of days, we noticed the steady growth of our social media community. "We needed to reach more people at our target markets to bring more tourists to our beautiful city. 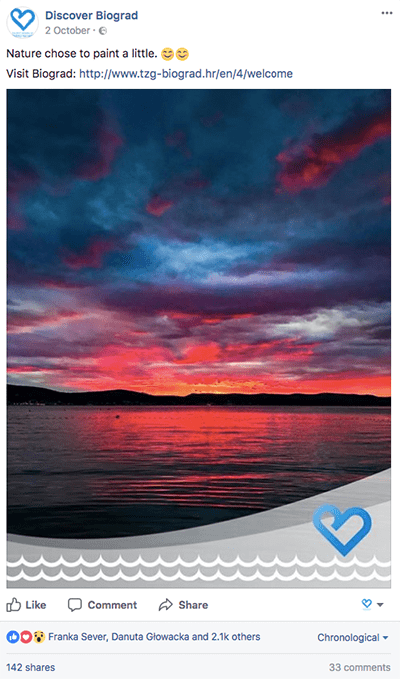 That's why we needed more awareness of everything Biograd has to offer as a perfect vacation spot. With their social media strategy and combined advertising, we received outpour of positive feedback from people all around Europe who found out about our city thanks to Facebook and Instagram."